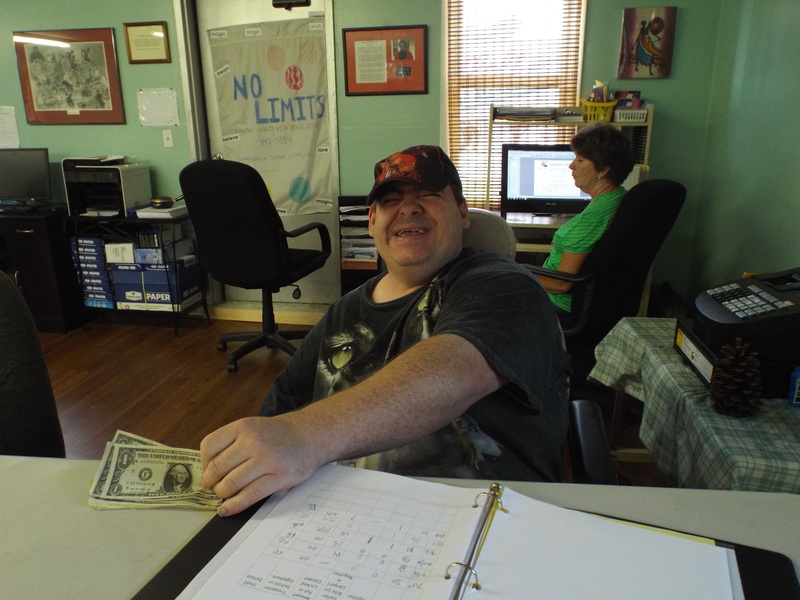 Our treasurer Matt counting the money for the week and doing a great job! Count on Matt, with your bad self! 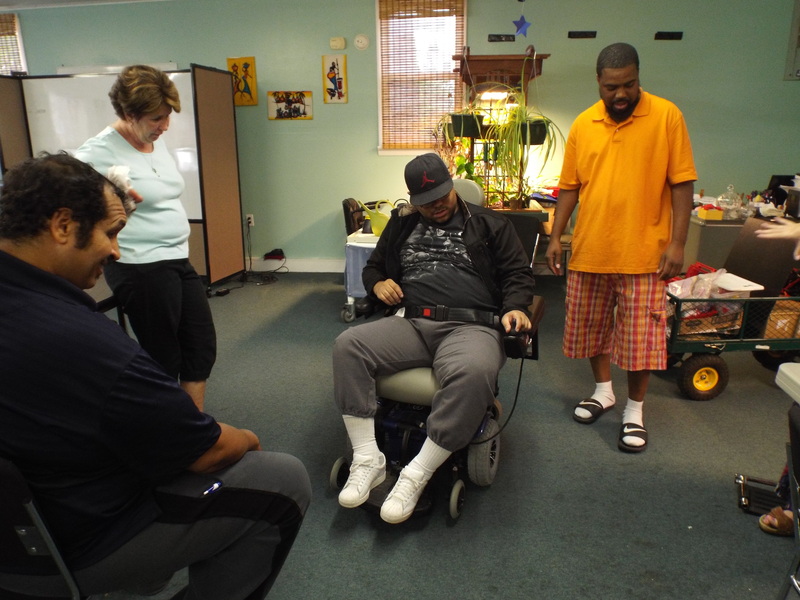 This week for our United Way Exercise the group traveled to G.F. Horne Assisted Living to see our friends. 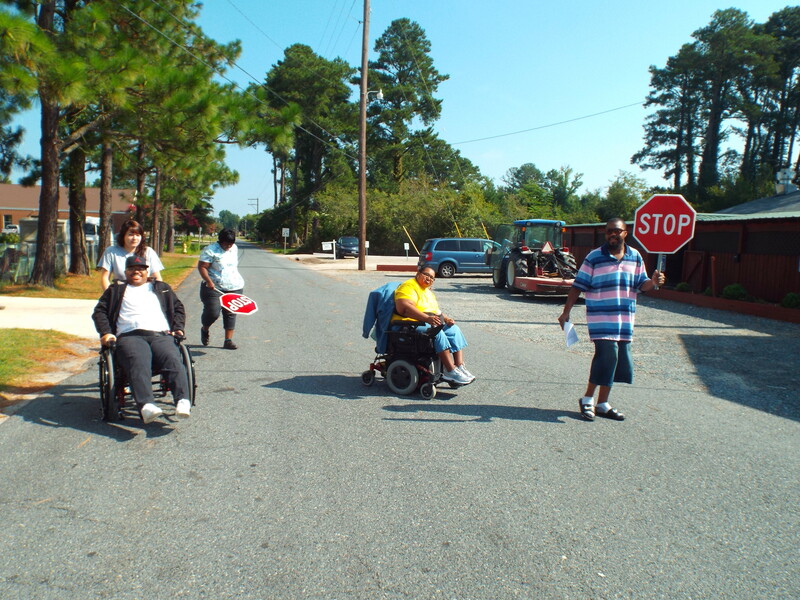 In order to get even more exercise we walked to their facility! Whew, what a work out! See y’all next month! 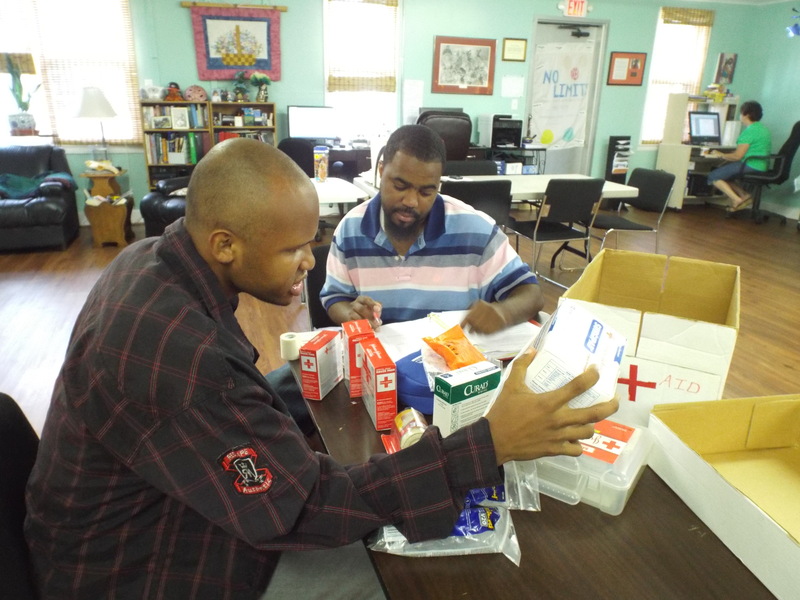 DJ and Steve working hard to make sure our First Aid Kit is all up to date. Work on my people, work on! We expanded our chicken coop by upcycling an old computer desk! 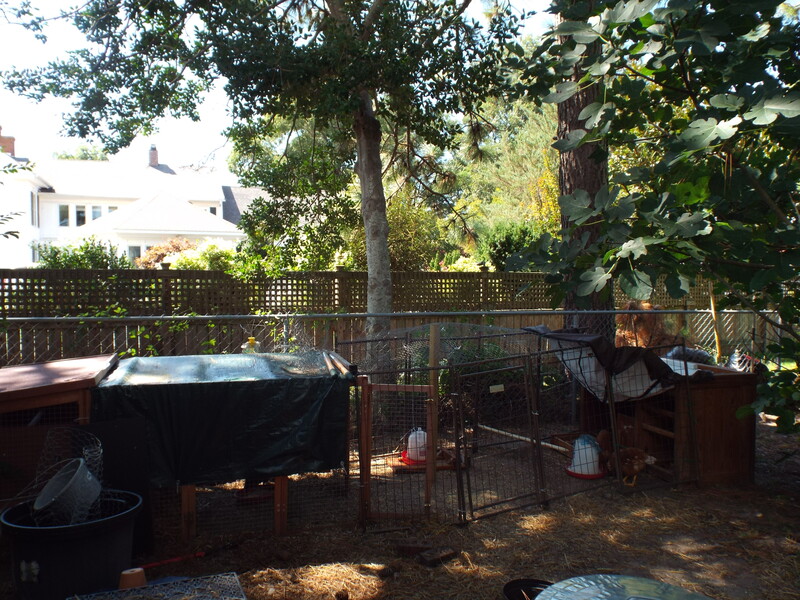 Now the chickens will have a nice, warm place to sleep and lay eggs in the winter months! 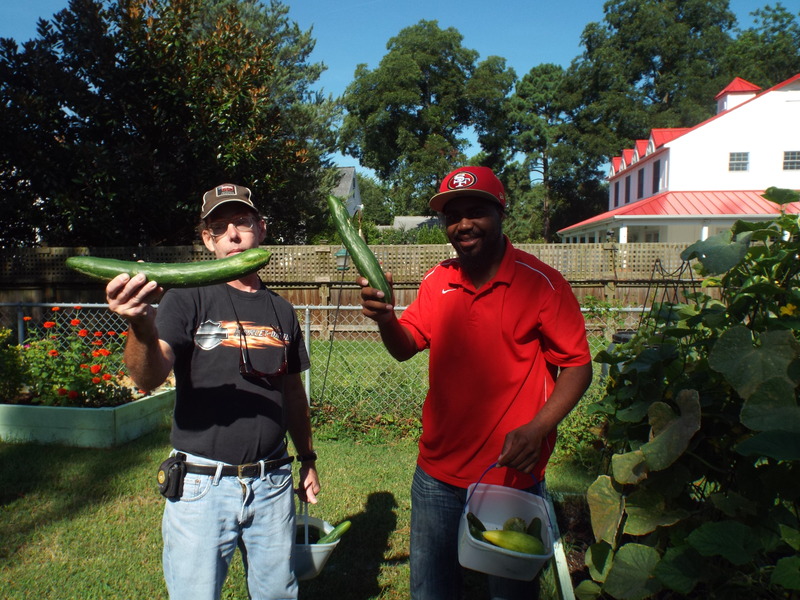 John, Zel, and Terrance picking some basil from the garden. John says that the smell of fresh herbs reminds him of the country. 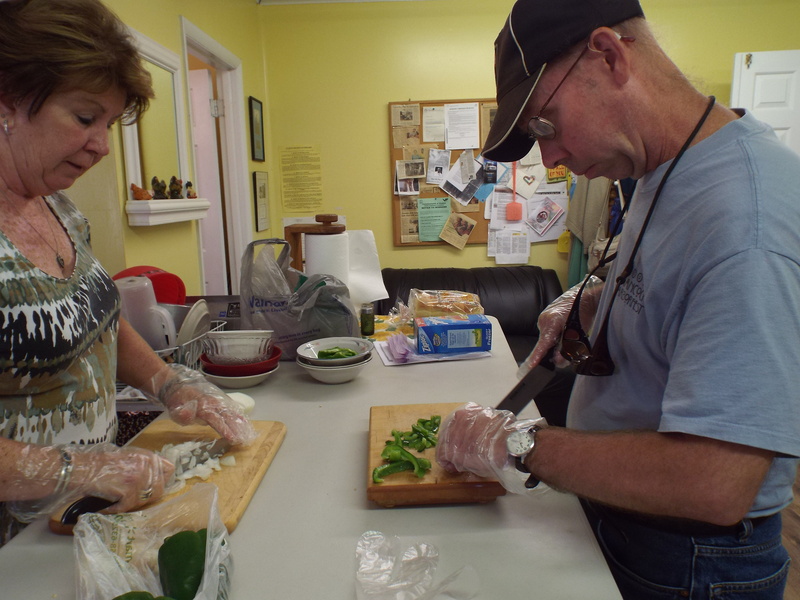 Maryann and David the No Limits Top Chefs chopping vegetables for lunch making day! 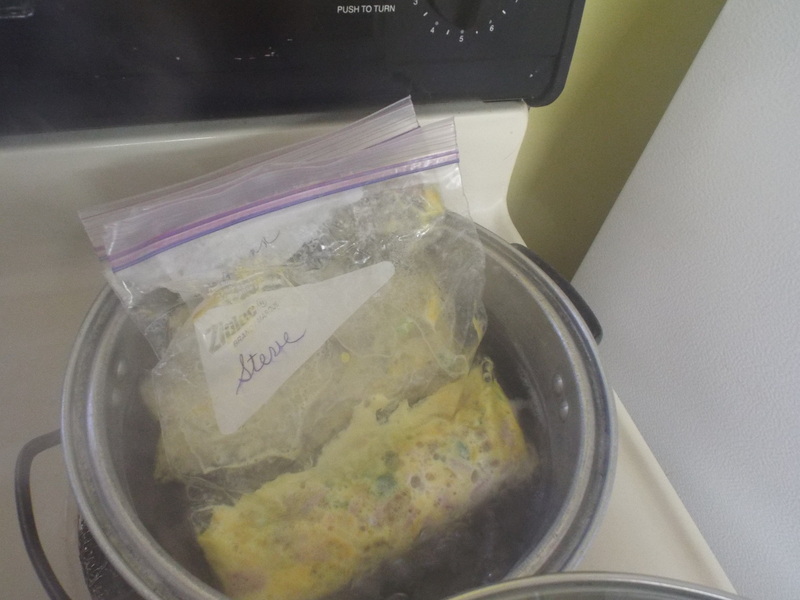 For our lunch making day we had omelettes in a bag! What a cool, new way to make omelettes! Our picture perfect finished product! 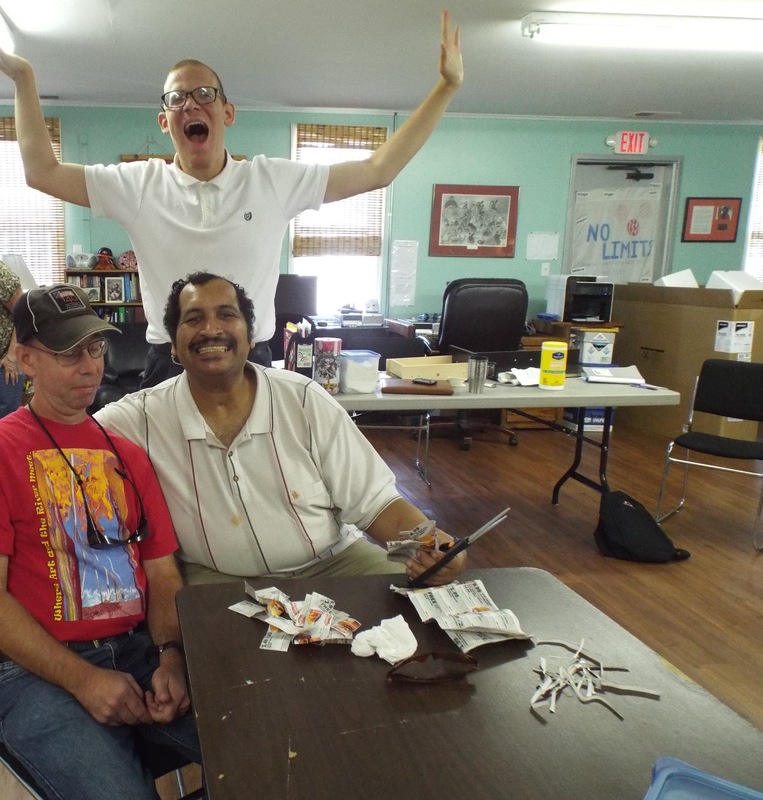 David says it’s one of the best lunches he remembers! 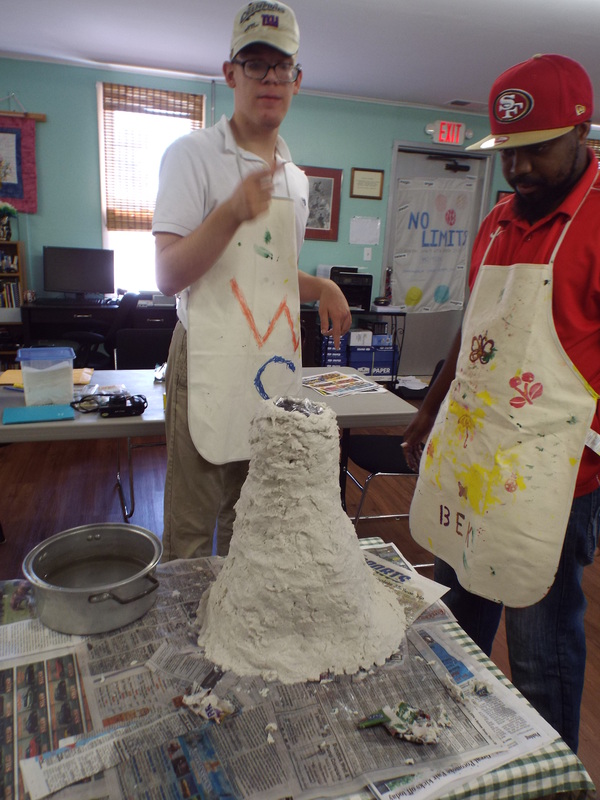 This week at No Limits we built a volcano. It was a BLAST!! All finished and ready to dry. 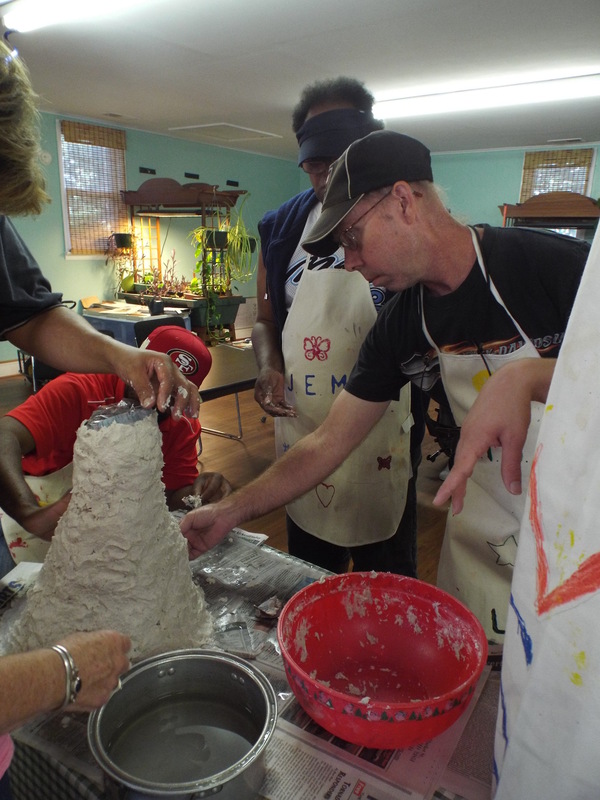 We’re now preparing for the eruption! 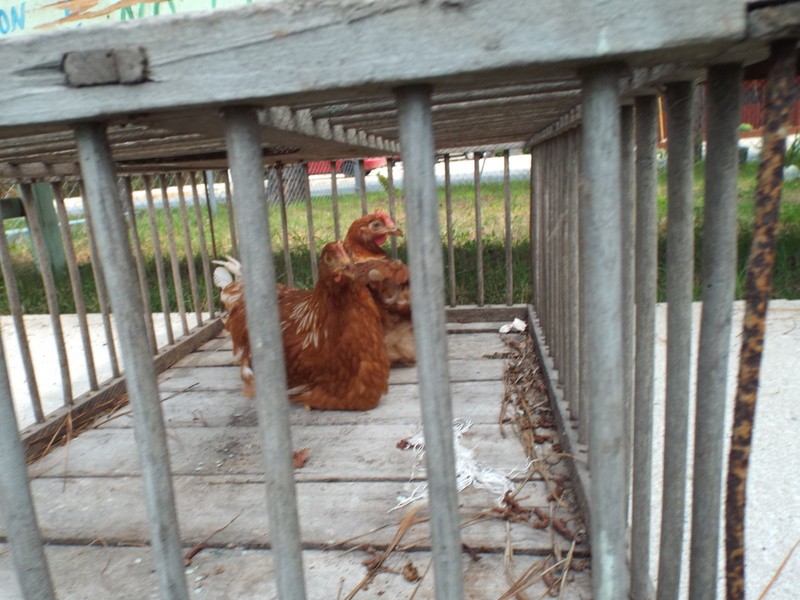 We got two new chickens this week at No Limits! Aren’t they pretty?! 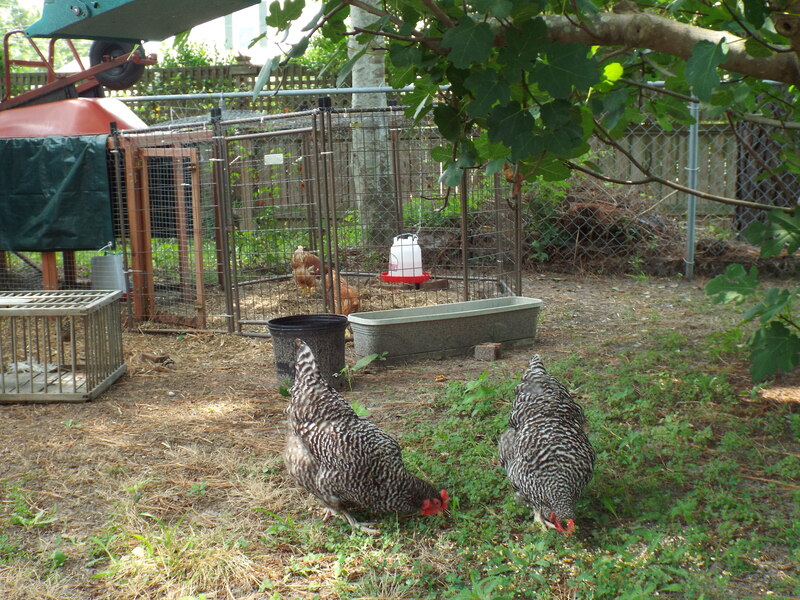 A picture of the new chickens eating behind the older chickens who were here first. They’re all starting to get along and we hope they become the best of friends! David and Steve spent an afternoon organizing one of our storage closets. It looks good guys! Way to go! 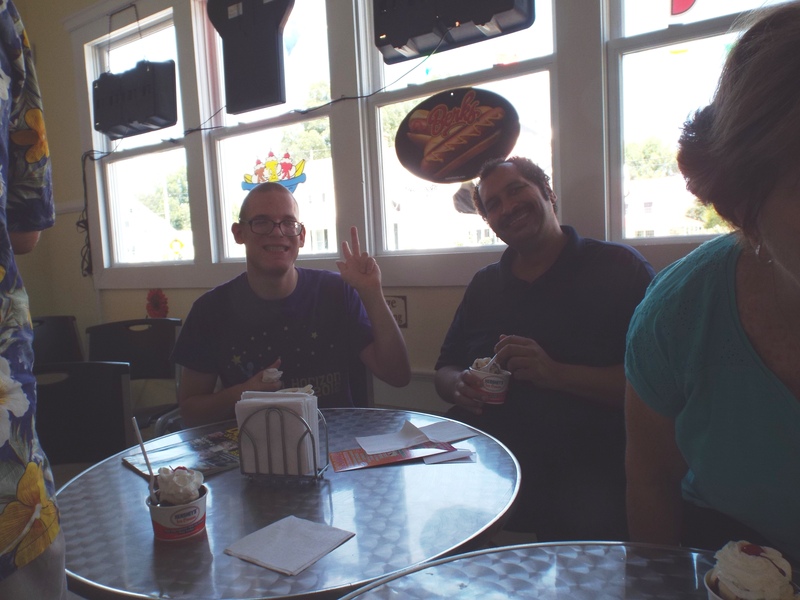 We took an outing this week to get ice cream. Here are Brandon and Zel posing for a picture before they dig in! 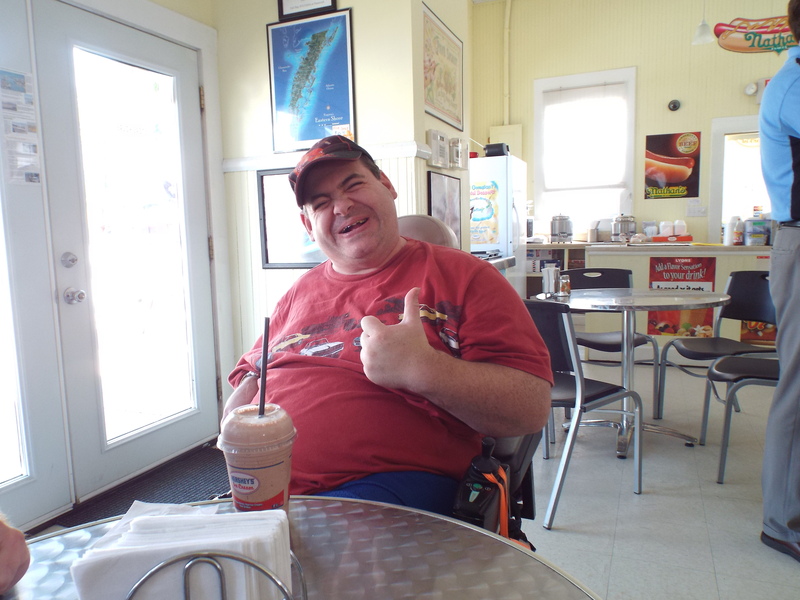 Matt was really excited for his chocolate shake! 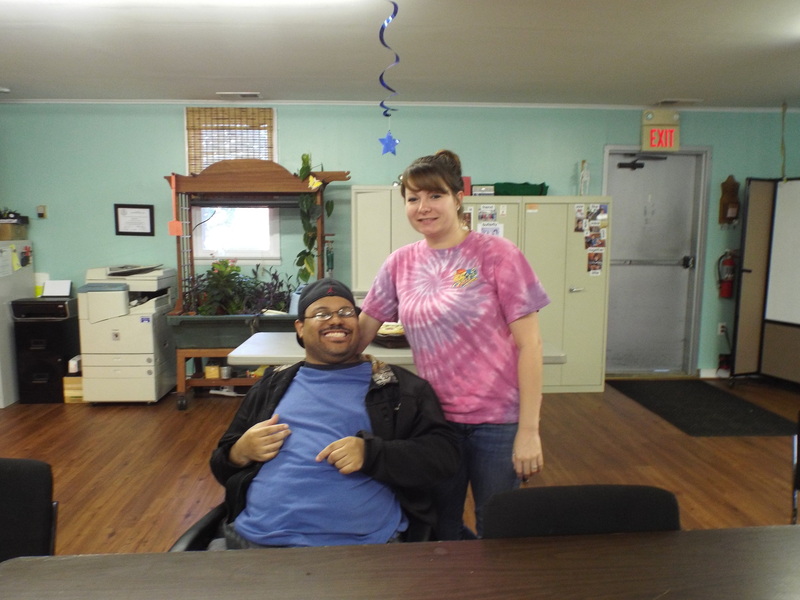 Terrance posing for a picture with his aide Brittney! They’re the bomb! David and Zel cutting out some coupons to put in our No Limits coupon book! Brandon snuck up on them pretending to be a shark!!! Haha! 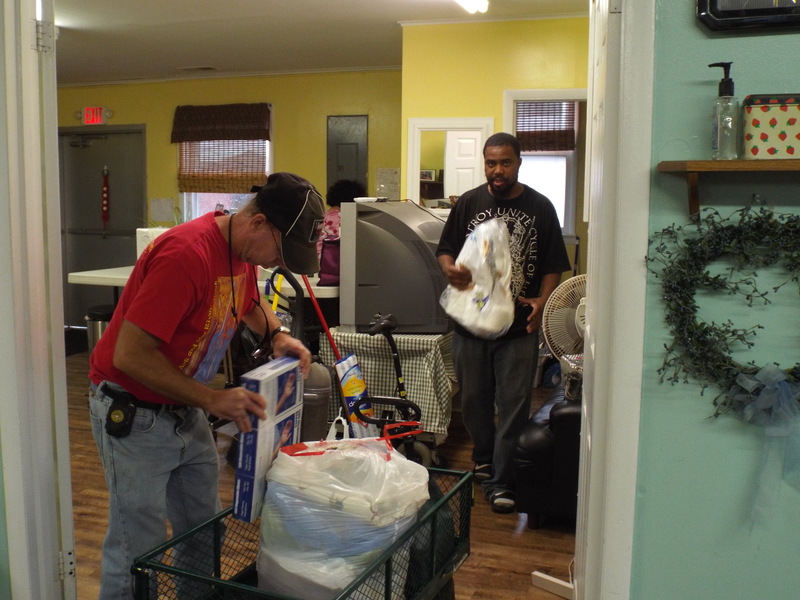 The group moving some furniture and small items out of the way last Friday in order to get ready for our new floors! Wow! Look at how awesome it turned out! 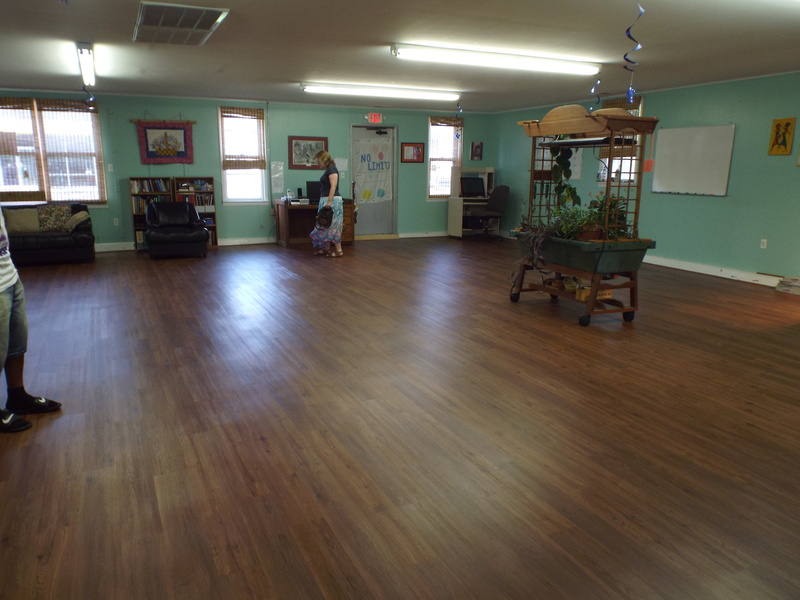 We think it looks so pretty! 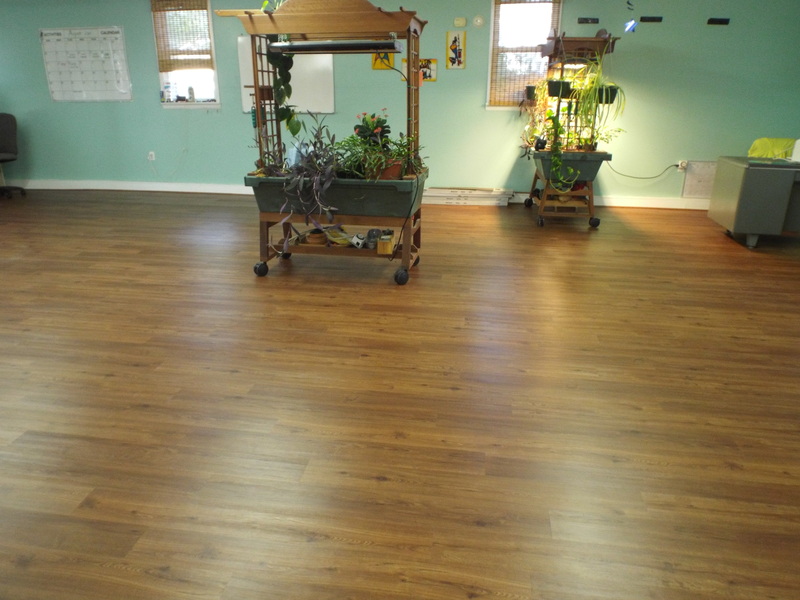 Lowe’s did a wonderful job! 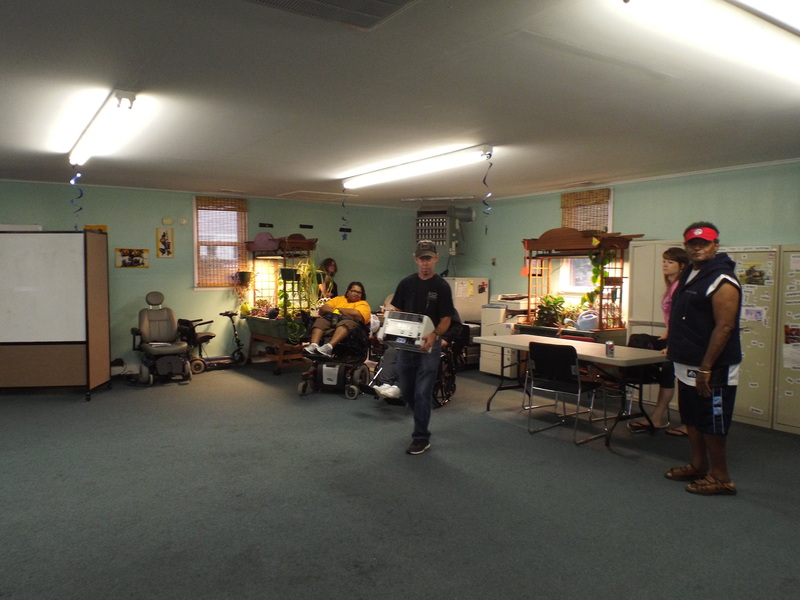 Thank you so very very much to the Department for Aging and Rehabilitative Services (DARS) Brain Injury Services Coordination Unit for assisting us with this much needed project!! 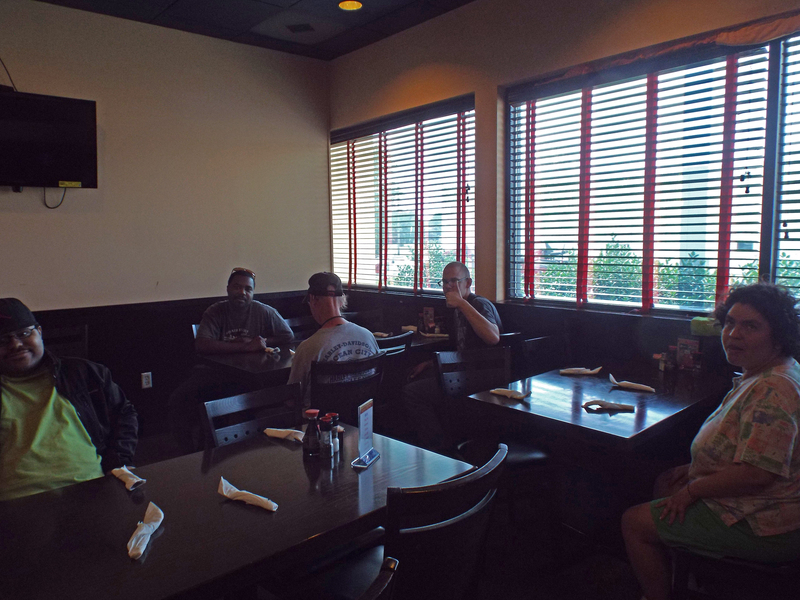 We took a group trip to Happy Buffet on our first day back from our mini vacation. 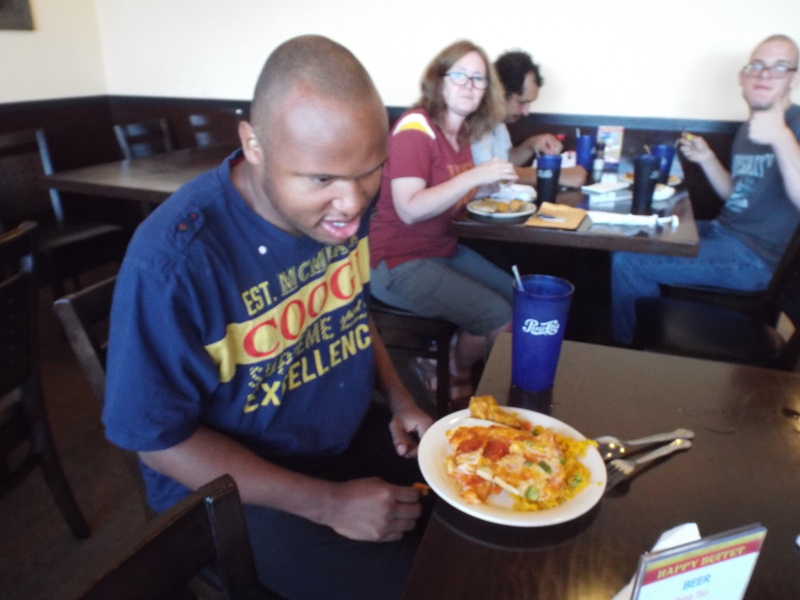 Beth says that the food tasted really good and Terrance says he loved it! 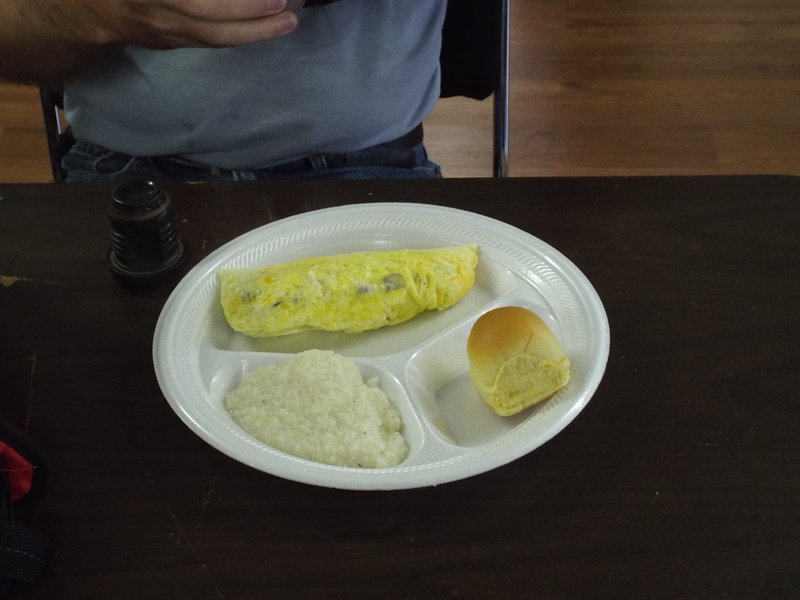 A picture of DJ’s delicious meal from Happy Buffet. We were surprised that Happy Buffet had such good pizza! 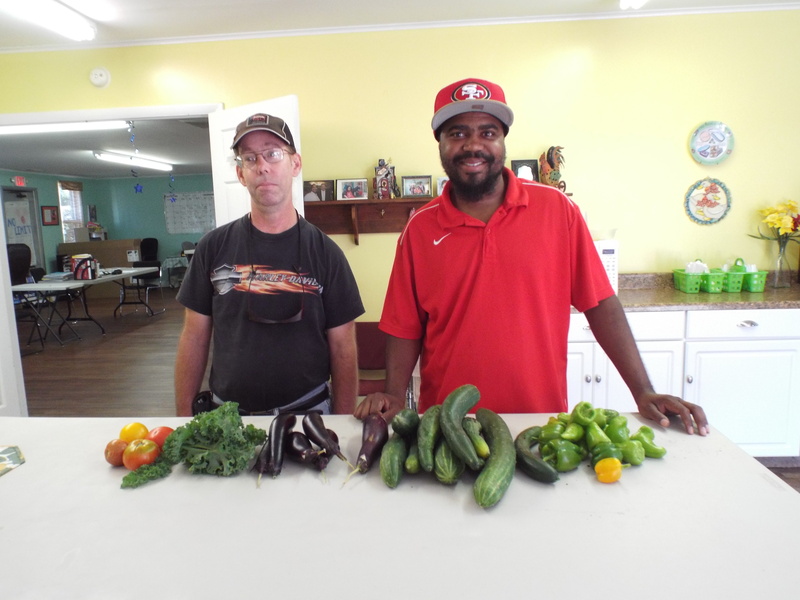 DJ and Steve staking the pepper plants to save them from falling over as they get bigger. 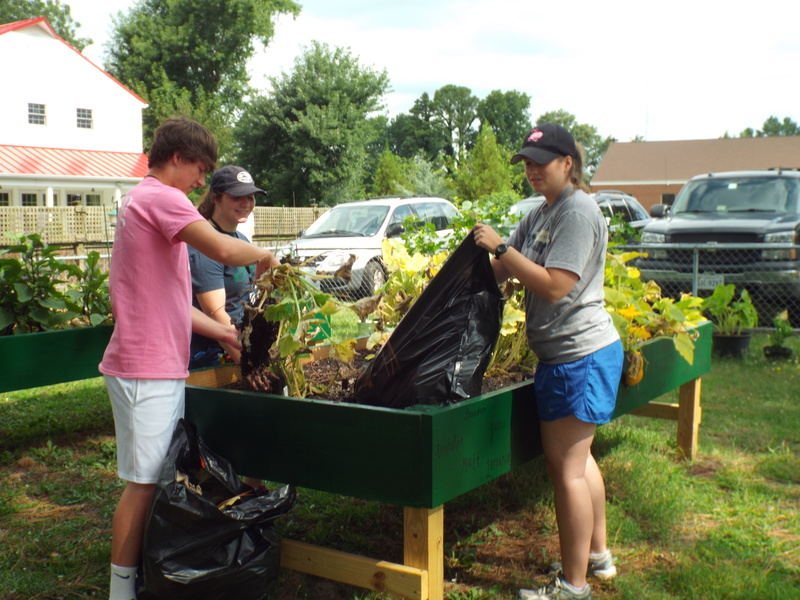 YouthWorks joined us for their last time this summer to help us take care of our yard/garden. In this picture they are helping us to pull up the last of the squash plants. 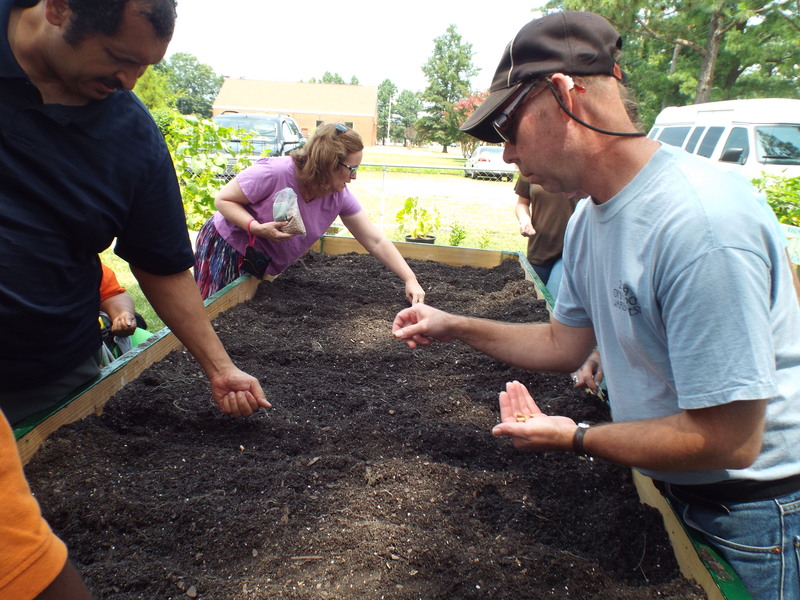 Out with the old in with the new – they’re making some room to plant green beans! Job well done! Thank you for the help! 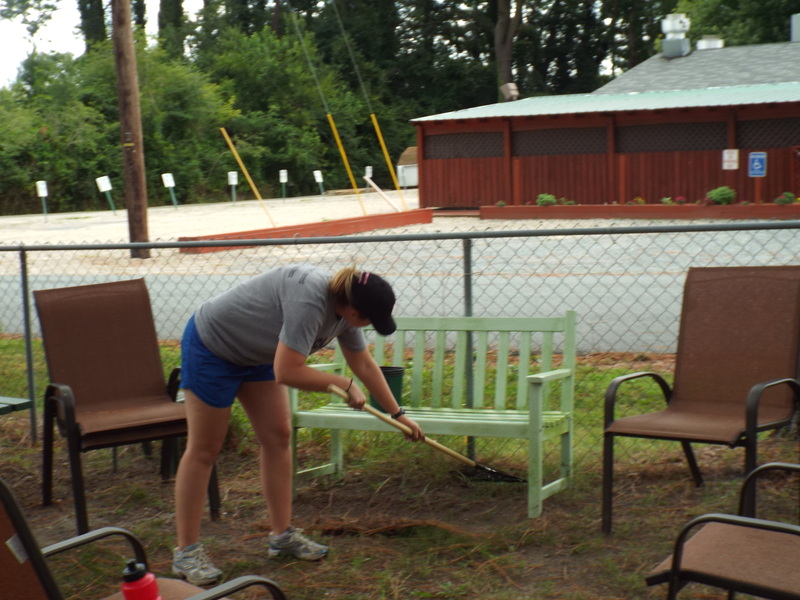 One of the students from YouthWorks helping to rake up our outdoor sitting area. Rake on girl, rake on! Do your thing girl, it looks very fab! 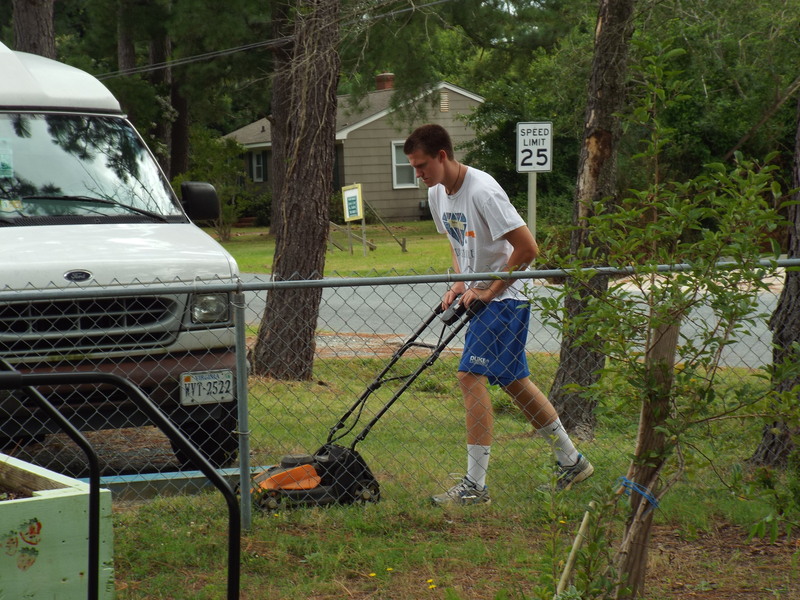 Another of the YouthWorks volunteers helping us keep our grass cut short. Mow on my man, mow on! 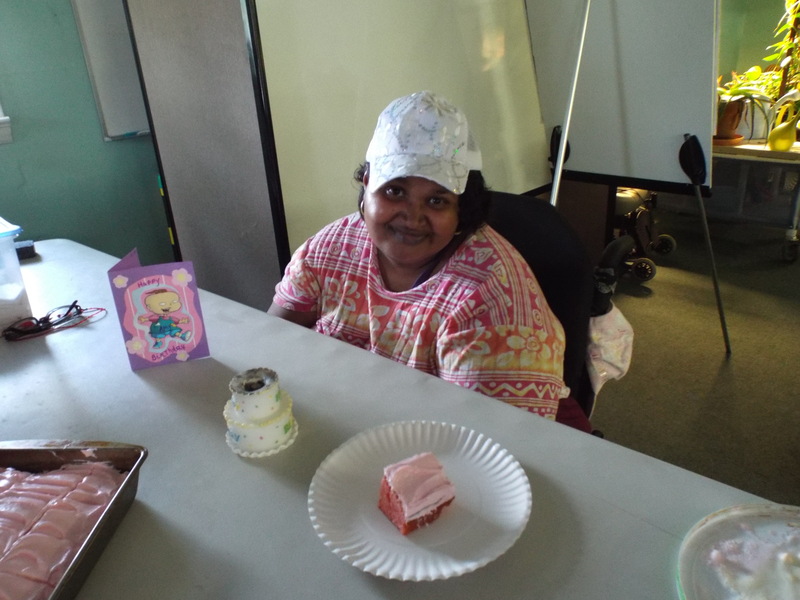 Thank you again for all the hard work you do! Come back again next summer y’all we really enjoyed having you! 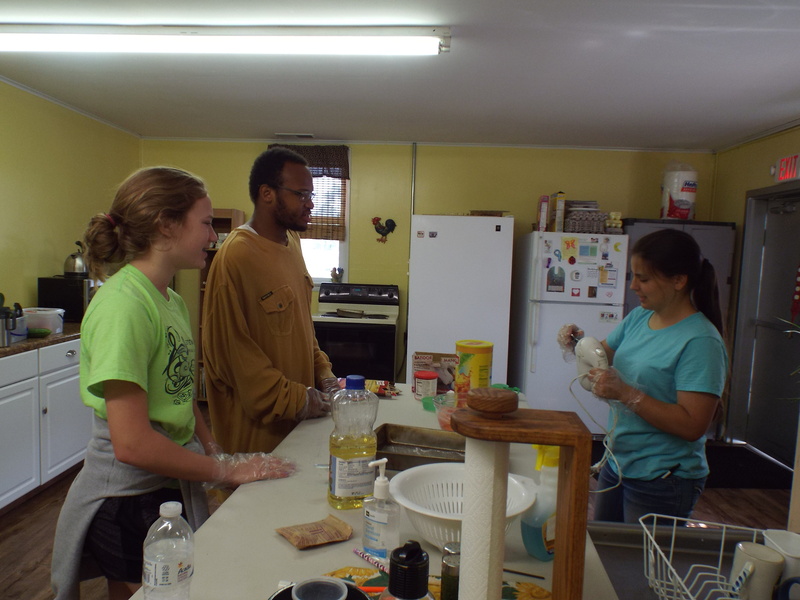 In this picture we have one of the YouthWorks volunteers, DJ, and Emma getting ready to make Amy’s birthday cake! Good lookin’ out guys! I’m sure Amy will love it! 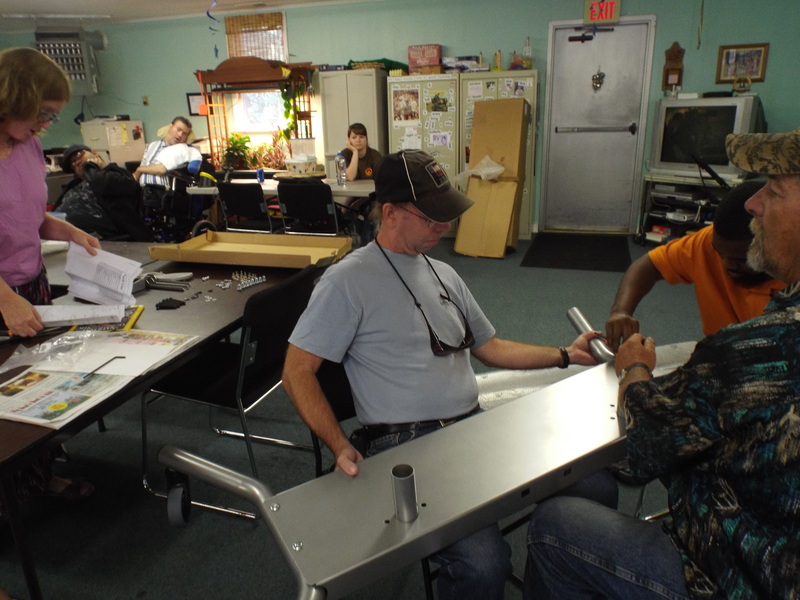 David, Chris, and Steve working to put together a new computer stand! Work on my boys, work on! Good job! 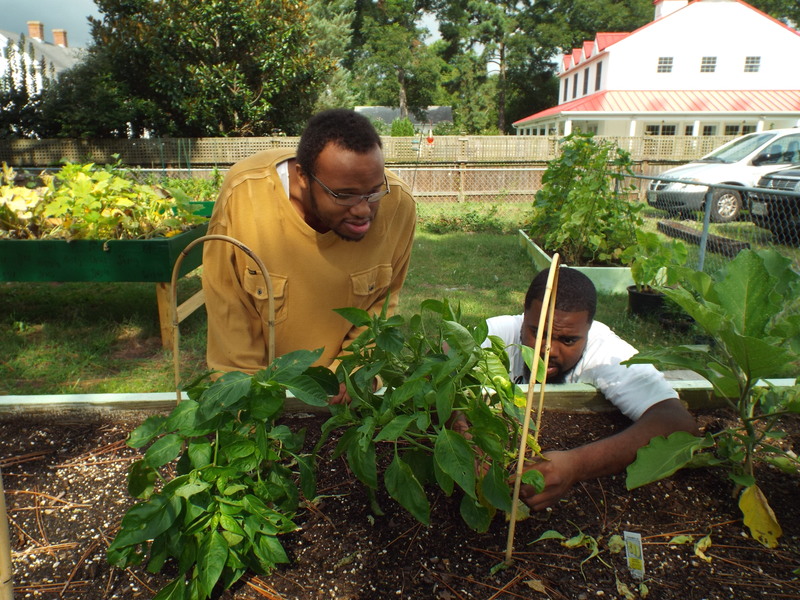 Zel, Rachel, and David planting some green beans in our newly cleaned out garden box. 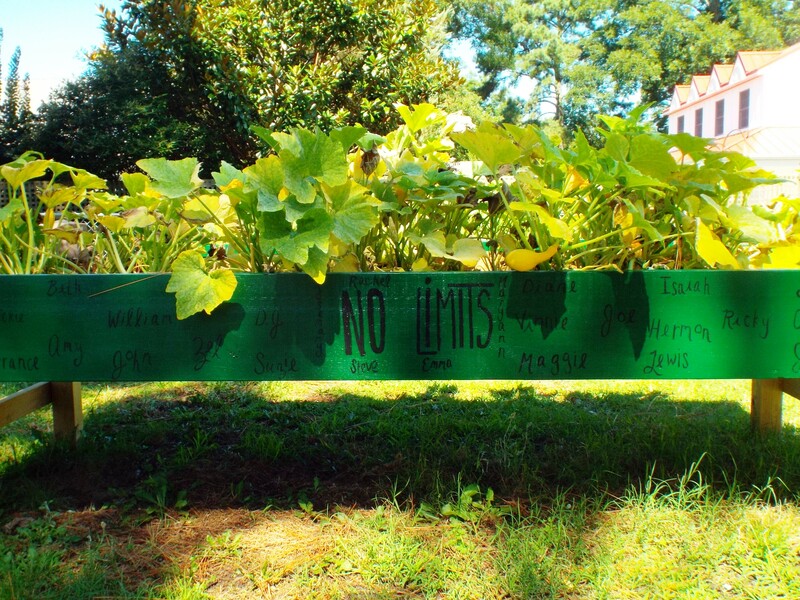 We can’t wait to harvest them! 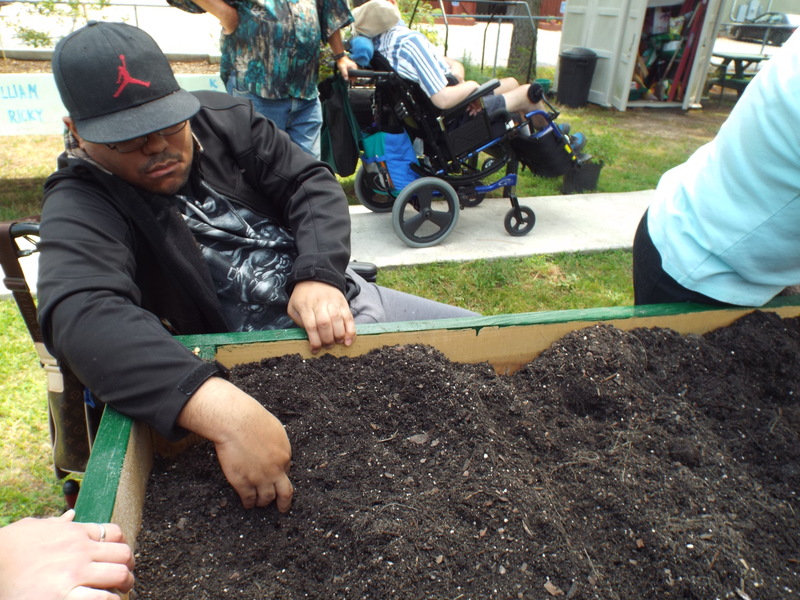 Terrance planting some more green beans! Plant on Terrance, great job! !